The KM Units of York and UVic are pleased to support Stephen Gaetz and homelessness research including the Homeless Hub. Mobilize This! recently wrote about some of this work and we are pleased to feature the re-launch of this knowledge mobilization website. As featured in Yfile on Friday the Homeless Hub will re-launch providing researchers, students, schools and decision makers with enhanced access to research on issues related homelessness. 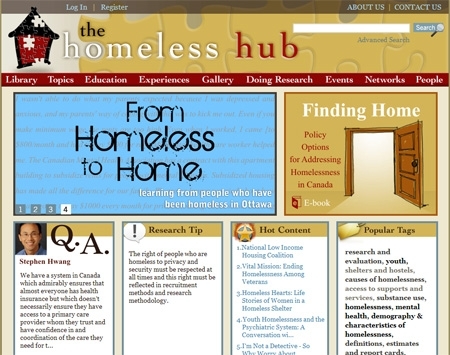 From the Homeless Hub web site “Launched in 2007, the Homeless Hub is a web-based research library and information center representing an innovative step forward in the use of technology to enhance knowledge mobilization and networking. The Homeless Hub has emerged as a place where community services providers, researchers, government representatives, and the general public can access and share research, stories, and best practices.” The new and improved Homeless Hub continues this work, makes research even more accessible and interactive, it includes resources for educators and it hosts a downloadable e book “Finding Home”. Stephen Gaetz (Faculty of Education, York University) is the principal investigator of the Homeless Hub which is supported by a SSHRC Cluster Grant and with support from Government of Canada’s Homelessness Partnering Strategy. He is also leader of the Canadian Homelessness Research Network. Pingback: The View from Here – KMb as an ecosystem « Mobilize This!